The Peruvian government has declared an environmental state of emergency after finding elevated levels of lead, barium, and chromium in the Pastaza River in the Amazon jungle, reports the Associated Press. Indigenous peoples in the area have been complaining for decades of widespread contamination from oil drilling, but this is the first time the Peruvian government has acknowledged their concerns. Currently 84 percent of the Peruvian Amazon is covered by potential oil blocs, leading to conflict with indigenous people and environmental degradation. The Peruvian Environment Minister, Manuel Pulgar-Vidal, said that Pluspetrol, which has operated the oil bloc in question—1 AB—since 2001, would be liable for cleaning up the pollution. But the minister also noted that Occidental Petroleum, which operated the bloc from 1971-2001, had not been environmentally responsible in its operations either. The news comes shortly after Peru set forth its first environmental standards for soil pollution, which the government claims is what led to the announcement of the state of emergency. For the first time Peruvian experts had standards by which to measure contamination in the Pastaza River bed. Pluspetrol now has 90 days to clean up the Pastaza River and mitigate risk to the local Quichua and Ashuar peoples. 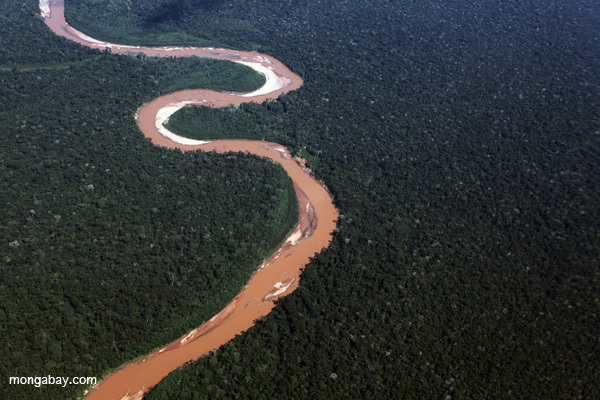 Peru has 659,937 square kilometers of its Amazon rainforest (84 percent) under actual and potential oil and gas development, an area larger than Afghanistan. Not surprisingly—given the scale—many of the oil blocs cover indigenous lands and protected areas. Such concessions not only imperil indigenous groups and the forest itself, but also many tribes that live in voluntary isolation who are especially susceptible to disease. Meanwhile oil companies are complaining that Peru’s regulatory process is stifling the development of the country’s oil fields. Dow Jones Newswires reports that 16 oil companies have come together to lobby the Peruvian government on increasing oil production. In 2009 conflict between oil development and indigenous rights erupted in violence. A clash between protestors and government police lead to the deaths of 23 police officers and at 10 indigenous protestors. Indigenous groups have since accused the government police of hiding protesters bodies in order to hide the scale of the violence.
? Kill of a Life Time – Zimbabwe (movie) Did you know ? ?